On 9 Jun 1987 I was leading a WINGS tour group at Churchill, Manitoba, and we chartered a small boat to go out on the river for an hour or so to see Belugas and look for birds. 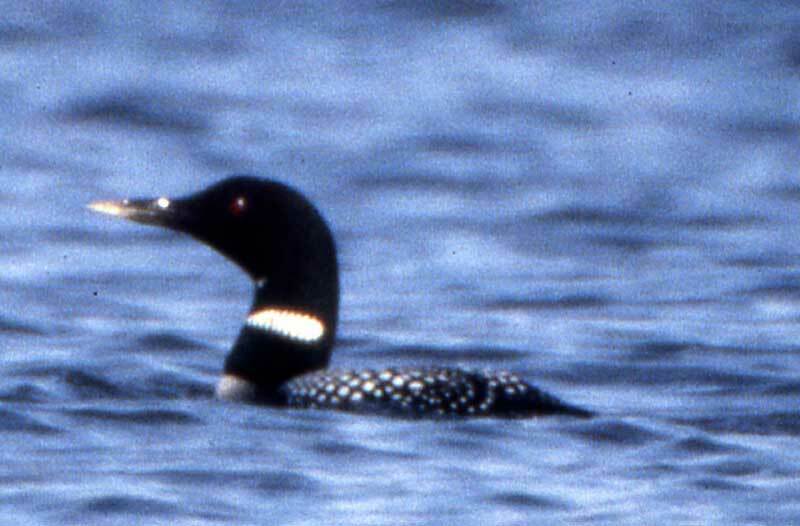 During this trip I spotted a distant loon on the water, which struck me as being large and long-necked with the bill held up at an angle like Yellow-billed Loon. That species is very rare in Manitoba, but the silhouette alone had me thinking this bird could be a Yellow-billed. As we approached more closely and came around to better lighting, it was clear that this bird’s bill was mostly dark, not pale, and that it was not a Yellow-billed Loon, but it still did not look like “just a Common”. I snapped a few pictures and we continued exploring the river. 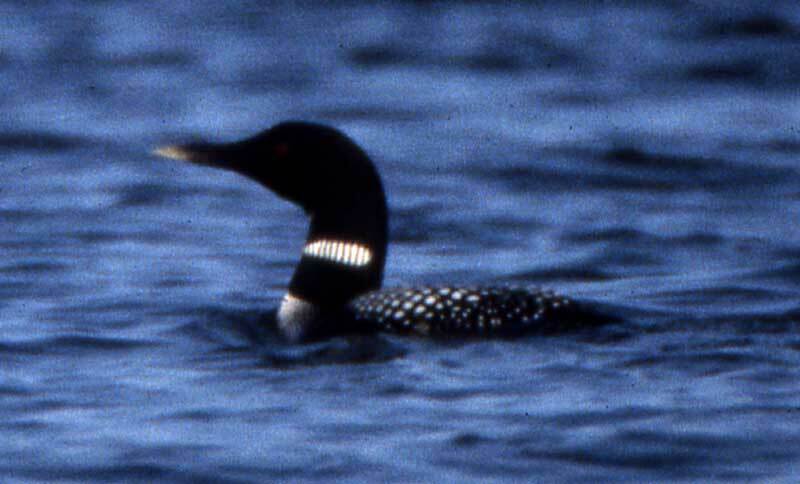 Apparent hybrid Yellow-billed x Common Loon showing the strongly bicolored bill and oval-shaped neck patch with few white stripes; 9 June 1987 on the Churchill River, 2 miles south of Churchill, MB. photos copyright David Sibley. Apparent hybrid Yellow-billed x Common Loon showing the strongly bicolored bill; 9 June 1987 on the Churchill River, 2 miles south of Churchill, MB. photos copyright David Sibley. Just a few minutes later we found a typical adult Yellow-billed Loon, with its massive pale yellow-white bill, which put to rest any lingering thoughts that the first bird might have been a Yellow-billed. The identity of the first bird remained a mystery until weeks later when I was able to study the two photographs. Several key features point to a hybrid Yellow-billed x Common Loon as the likely identification. Size and proportions were what caught my attention in the first place, and this is shown in the photos, but is not conclusive. The bill color – dark at the base with the distal third or more pale horn-colored and palest at the tip – is very unusual for Common Loon. Many Common Loons have some pale at the tip of the bill, but that is generally a pale horn color of very limited extent, unlike the obvious pale tip of the bill than this bird. I have never seen a Common Loon with such an obvious and extensive pale tip, but because the difference is a matter of degree I consider this feature suggestive of a hybrid and not conclusive. The strongest features indicating a hybrid are the shape of the largest white neck band and the number of vertical dark stripes across it. Yellow-billed has an oval patch, tapering front and back, with only about 10 vertical dark stripes across it. Common Loon has a triangular white patch, broadest at the rear, with about 17 visible dark stripes across it. The Churchill bird shows an intermedate-shaped white band with about 12 visible dark stripes. Typical necklace patterns of Yellow-billed (left) and Common Loon (right). Traced from photos. This hybrid combination has been reported only twice before. A specimen from the Netherlands 4 Dec 1890 analyzed in detail by Roselaar et al. (2006), and a specimen from Port Credit, Ontario 7 Dec 19561. Both of these specimens are in nonbreeding plumage, and therefore much more difficult to identify than the breeding-plumaged bird from Churchill. In addition, a mixed pair with two chicks (of unconfirmed parentage) was seen in the Brooks Range of Alaska (in Roselaar et al. 2006). Hybrids are certainly rare, but are probably under-reported because of the difficulty of identifying birds in nonbreeding plumage, which is when most loons are seen. Observers should keep in mind the possibility of hybrids especially when identifying Yellow-billed Loons south of their normal range. Roselaar, C. S., T. G. Prins, M. Aliabadian, V. Nijman. 2006. Hybrids in divers (Gaviiformes). J Ornithol. 147: 24–30.